Workplace discrimination is unfortunately something we see far too often… Looking back to United States history we see the Civil Rights Movement of the 60s and many new laws introduced that barred employers from being able to discriminate against employees on many grounds. This means that no matter what race, national origin, gender, or religion you are, you have rights to remain in the workplace. Employers are not allowed to use discrimination as a tactic of refusal to hire, discipline, firing, denying training, failing to promote, paying less or demoting, or harassment. Over the years, many anti-discrimination laws have been enacted to protect the rights of workers. If you have been discriminated against in the workplace, you may be able to file a lawsuit against an employer. However, these suits are typically handled by the organization “Equal Employment Opportunity Commission (EEOC).” They investigate the claims and take action against the employers who have worked illegally. However, you must be able to do so within time constraints of the statute of limitations. Employers are not able to deny you a job or fire you just because of your national origin or citizenship status. Employers also cannot refuse to accept your legally acceptable documents concerning your status. Employers are not permitted to reject documents due to a future expiration date. You cannot be terminated solely because of E-Verify; instead, you should be given the opportunity to resolve the issue. Employers usually cannot require you to be a U.S. citizen or a lawful permanent resident. If you have been discriminated against in the workplace in any of these ways, you are permitted to contact the Office of Special Counsel (OSC). The OSC is a federal investigative agency with rights to prosecute if necessary. They have also executed an easy system for filing against an employer who has treated you unfairly. The Immigration Reform and Control Act has barred any employer who has more than three employees from discrimination based on national origin grounds. If a citizen is a U.S. citizen or one who may work legally but is not yet a citizen, then they cannot be discriminated against under any circumstances and can work legally for the employer. This law came into play when the U.S. decided to strengthen penalties against the employers who hire illegal aliens. In the United States, each citizen has a right to work. If an employer has been denying you rights, you can take legal action against them. 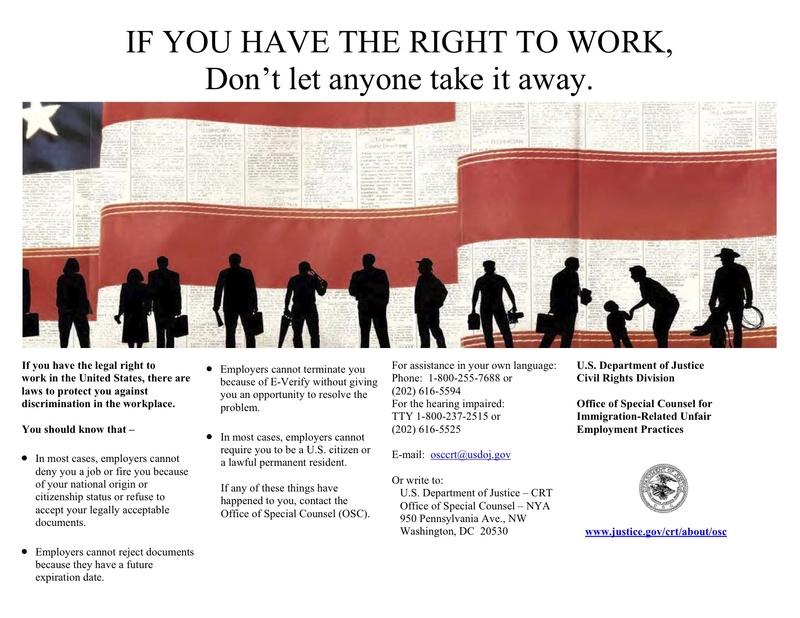 Right to Work shows employees that they do, in fact, have rights that they are entitled to in the Workplace and how to execute them.